This week's host for Sunday Supper is Cindy of Cindy's Recipes and Writings. Cindy chose Easy to Make Patriotic 4th of July Recipes. Since tomorrow is Independance Day here in the USA these recipes have to be super easy so that you can share them during your celebration tomorrow. Well folks, this is about as easy as it gets. 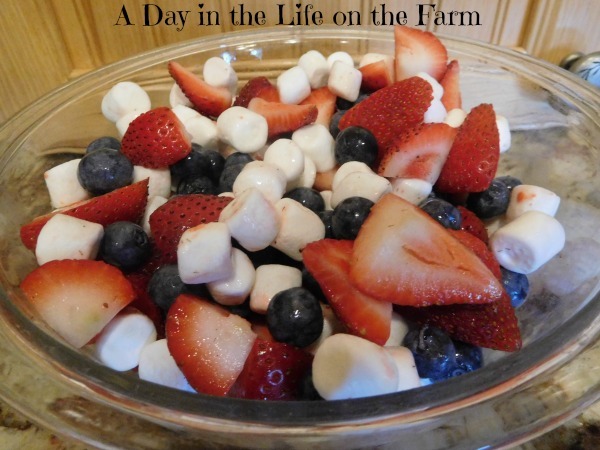 Throw together this gorgeous red, white and blue fruit salad, grab your beach towel and lawn chair and head out to picnic and enjoy the beach, parade, fireworks or whatever it is you do to celebrate our Nation's Birthday. Most of all stay safe, have fun and eat well. Happy 4th Everyone!!! Everybody loves a quick dessert like this fruit salad! Win win! You are right Cindy. Thanks for hosting. Great idea with marshmallows. And yeah, it's perfect for a beach. My kids love marshmallows! What a great idea to add them for "white" in a fruit salad! I know it made my Little Miss happy Liz. My kiddos would love this. We all love marshmallows at my house!! Are those marshmallows I see?! LOVE IT!!! I hope you had a wonderful Independence Day. Thanks Lauren, I hope you did as well. Thanks Kelly, easy peasy and delicious. My toddlers would go crazy for a big bowl of this salad!! It is popular with the toddlers but I think you will be surprised how much the adults love it too.